Let There Be Lacquer: My First Jelly Sandwich!! I'm growing up! haha, I have been doing this blog consistently for about 2 months now and I want to start doing things that the other blogs are doing. I really like the look and idea of jelly sandwiches so I decided to give it a go. 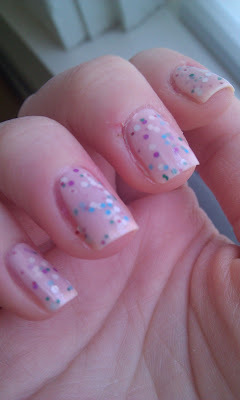 I went through my stash to find my possible jelly polishes. 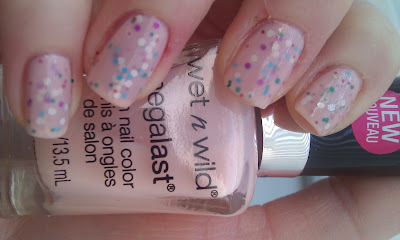 I don't have that many but a new wet n wild megalast (Sugar Coat) turned out to be an unlikely candidate. I bought Wet n wild Party of 5 Glitters especially for this occasion because it has multi sized and multi colored glitter. 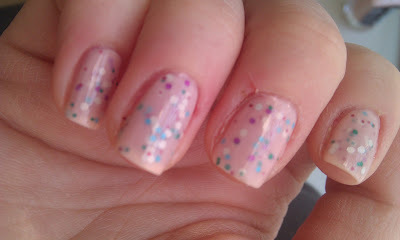 This manicure also doubles for Pink Wednesday! Another first! (Lots of layers) Sugar Coat. Party of 5. Sugar Coat. Party of 5. Sugar Coat. Seche. Love this! I wore it for three days! I can't even remember when I last wore a mani that long. 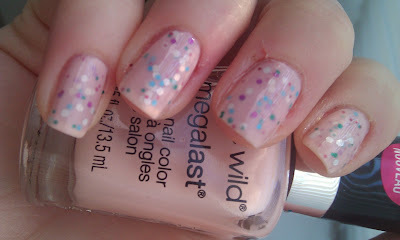 Well I hope you like, I splurged quite a bit in the last couple of days so look forward to some awesome new polishes!